Why do I need a Wedding Ceremony Coordinator? Many Wedding Ceremonies present an interesting challenge in terms of their coordination. While it's true that all Ceremonies have a Wedding Officiant, many do not have a Coordinator. In fact, in most cases, the Wedding Officiant performs both the Ceremony and the Coordinating duties. While this may be easier with a simpler or smaller wedding, we've found that, because of the number of details involved, the coordination of a Marriage Ceremony grows more difficult the larger and/or more complex the Wedding. Add a DJ or Musicians into the mix, along with a Photographer, Videographer, flowers, etc., and a Coordinator becomes increasingly necessary to make sure that the ceremony plays out as it was planned. What does the Wedding Ceremony Coordinator do? At the Rehearsal, and/or on your Wedding Day, the Wedding Ceremony Coordinator works closely with the Marriage Celebrant in directing the Ceremony. While the Celebrant will help you in the various aspects of creating the Ceremony (like choosing the readings, writing your vows, choosing an order of events, etc. ), the Coordinator will be the person who takes care of the physical logistics, movement, appearance, and etiquette of your wedding party. The Coordinator also keeps the other professionals (e.g. Musicians/DJ, Photographer, Videographer, etc.) aware of the Ceremony's timing and activities agenda. 1) Coach the Ushers on their duties including how to seat guests (especially the VIP's), and how to line up when the Ceremony is about to begin. 2) Instruct the Bridesmaids on how they are to line up for the beginning of the Ceremony, and the order and manner in which they will process up the aisle. 3) Make sure the Celebrant, Bridal Party, and Bridal Couple know where and how they are to be standing during the Ceremony. 4) If the Bridal Party has to move at any point in the Ceremony, instruct them on how they will be moving. 5) Make sure the Bride knows what to do with her bouquet during the ring exchange. 6) Make sure that all the participants understand the important details which will effect them during the Ceremony. 7) Make sure the Readers know where the reading materials are and where the readings will be taking place. 8) If there is going to be a Unity Candle Ritual, coach the Mother's of the Bride and Groom (or other VIP's) on the timing and procedure for lighting the taper candles. 10) Instruct all the members of the Wedding Party on how they are to recess back down the aisle after the Ceremony is done. 1) Make sure that everyone who has duties to perform is clear on what they need to do and when. 2) Help pin the boutonnieres and other flowers on all the VIP's. 3) Be sure that the Ushers assume their positions and seat guests in the appropriate fashion and place as they arrive. 4) Check the Bride's appearance including hair, make-up, bridal gown, train, headpiece or veil, flowers, etc., both when she arrives and just before her entrance, making any necessary adjustments. 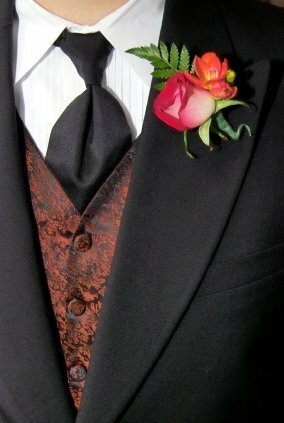 5) Check the Bridesmaid's and Groomsmen's appearance including hair and boutonnieres, making any necessary adjustments. 6) Ensure that the members of the Wedding Party are in the right order for the processional and know where they will be standing at the front of the Ceremony site. 7) Help direct the Ring Bearer and Flower Girl. 8) Answer any last-minute questions from anyone involved in the Wedding. 9) Cue the Bridal Party as well as the professionals at your Wedding (e.g. Musicians/DJ, Photographer, Videographer, etc.) when the processional and other important activities are about to begin. 10) Offer seating assistance to any late-arriving guests. How much do you charge for the Wedding Ceremony Coordinator? The Wedding Ceremony Coordinator comes at no fee for both the Rehearsal or the Ceremony when the Custom Designed Ceremony is chosen and the Officiant will be attending the Rehearsal. Again, it is our attempt to assist in making your Wedding Day as stress-free for you as possible while helping to make sure that the event is coordinated to your expectations. My Function Hall has a Wedding Coordinator - why do I need another one? You may not. There are many fine Function Coordinators in Massachusetts, Maine, and New Hampshire. If you feel comfortable with the Wedding Coordinator assigned to you by the banquet facility, there is no need to use ours. You may want to speak with the Function Hall Coordinator to get a feel for exactly what s/he will be doing. Some of them have very limited duties, while others handle everything from beginning to end. Some might be very pleased to have some additional help, while others might prefer to do it themselves. We really would prefer not stepping on the toes of other professionals. Can't I just use a friend? You certainly can. We offer the Wedding Ceremony Coordinator because we are as concerned as you are that your Wedding is the best it can be. It helps to ease your mind, and it avoids your having to use friends or relatives who may not be as versed in Ceremony coordination as we are. Does the Wedding Ceremony Coordinator plan everything? Not at all. The Ceremony Coordinator is there to make some suggestions, and assist with the physical logistics, movement, appearance, and etiquette of the Bridal Party at the Rehearsal and/or Ceremony based on your expectations. As previously mentioned, we don't want to write and/or plan your wedding - we want you to do that with our help. The Coordinator is just one of the professionals along with the Celebrant who can help you to create and organize your own Marriage Ceremony. Will the Wedding Ceremony Coordinator try to take charge of the entire wedding? Absolutely not! The Ceremony Coordinator will be following the guidelines as set by you and discussed in the Ceremony Planning Consultation. How does the Wedding Ceremony Coordinator handle emergencies? In whatever way necessary! Our Ceremony Coordinator brings an emergency kit that contains a sewing kit, safety pins, small scissors, clear nail polish (helpful for stocking runs), a nail file, straws (for drinking without messing up lipstick), hair spray, brush and comb, bobby pins and hair elastics, static-cling spray, tissues, handkerchiefs, a lint brush, earring backs, baby powder (also useful for getting out last-minute spills on a white dress), eye-drops, contact lens solution, antacid, smelling salts, mints, headache medicine, band-aids, moist towelettes, dental floss, etc. As an example of one emergency, at one of our events, one of the Groomsmen locked his keys in the car while it was still running. Our Coordinator (Cathy at that event) just used our AAA card to contact a local garage and they took care of the problem. The Groomsman and the family were very grateful. It's the little things like this that our Wedding Ceremony Coordinator can help with. While it won't make or break a Ceremony, it can help things to run much more smoothly so you can enjoy your Wedding Ceremony without worry! for each of you will be a shelter to each other.